Did you guys miss me? I missed you all so much! You guys must be wondering why I’m only posting twice a week now. Well, I’m currently working 9 to 6 and within the weekends, creating two blog posts itself feels like an accomplishment. It’s as if my creative side awaits the weekend, in order to create that mess which turns out to be a beautiful flatlay! It happened with me so many times that I’d go ahead shoot twice for the same product because one thing or the other failed to impress me. And even though it gets hectic, I’m no way going to stop curating what I love. So keep patience and do let me know if you have any product review suggestions. I would love to take your requests as that’s what I’m here for. 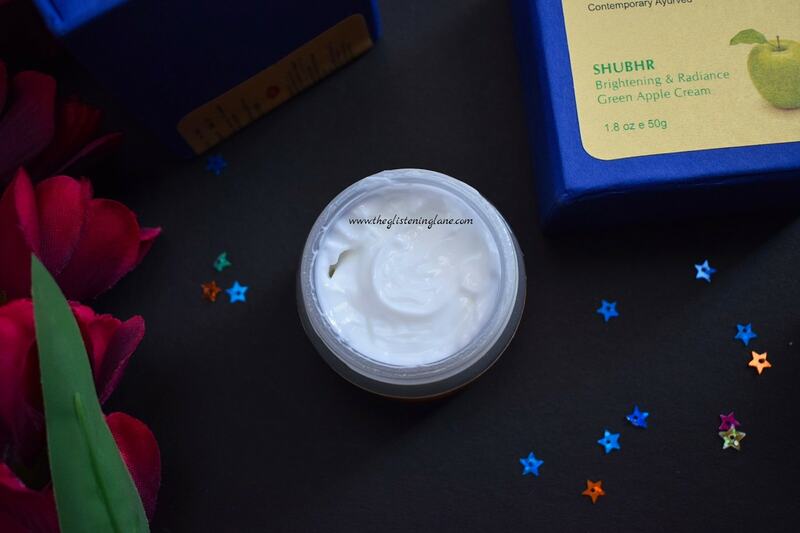 Today's post is my take on the blue nectar cream. So, you guys know how I detested creams all my life! I’m currently 23+ and shall be 24 in the coming month of October. During this winter season, I noticed that my skin behaved completely different than how it did earlier. It was going all the more flaky, drying and dull. Gradually, thanks to the trial and error tactic, I realised that probably my skin is leaving behind the elasticity of the late teenage years. The only rescue I could cater it was to apply lots of hydrating products, if not in the morning but at least before heading off to sleep. Since then, I started including slightly hydrating products instead of those which take away any traces of sebum. It could probably because the summers haven’t reached its peak and till date I’m in love with how creams have been helping me out. And when it comes to creams, not everything suits me. 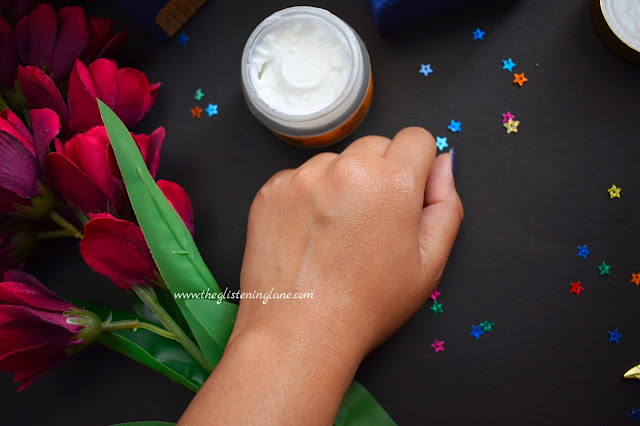 Today, I shall be introducing my recent addition to the skincare vanity which I’ve been loving to such an extent that I don’t want to be separated from it. God knows, what I’ll do when this jar of cream will get empty! 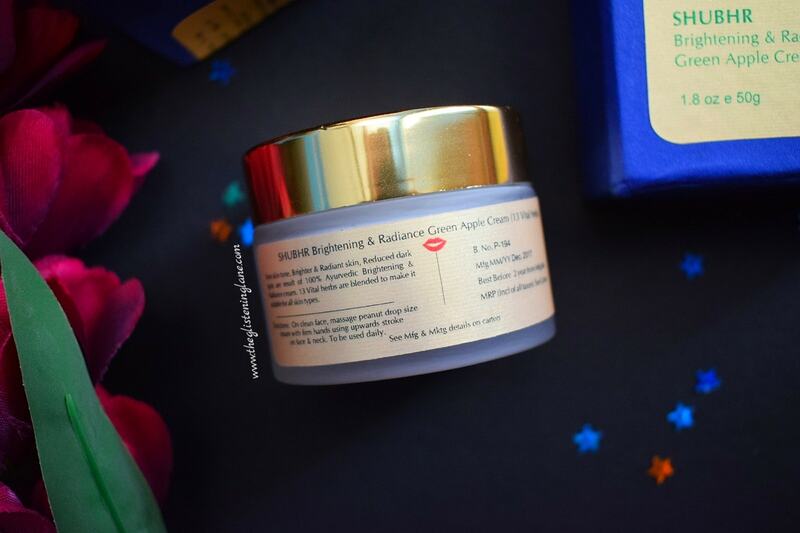 I can vouch on the fact that it is a must have brightening cream for oily skin. Without more delays, let's begin! 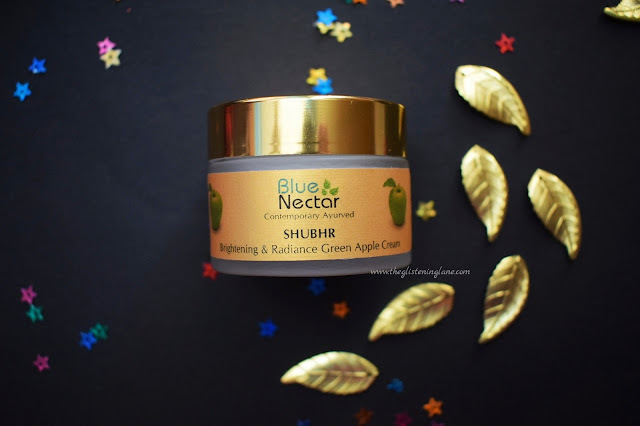 Description: 13 Vital Herbs like Yashad Bhasma, Mulethim, Aloevera in Shubhr Green Apple Cream helps to even skin tone, get brighter and radiating skin, and reduce dark spots. 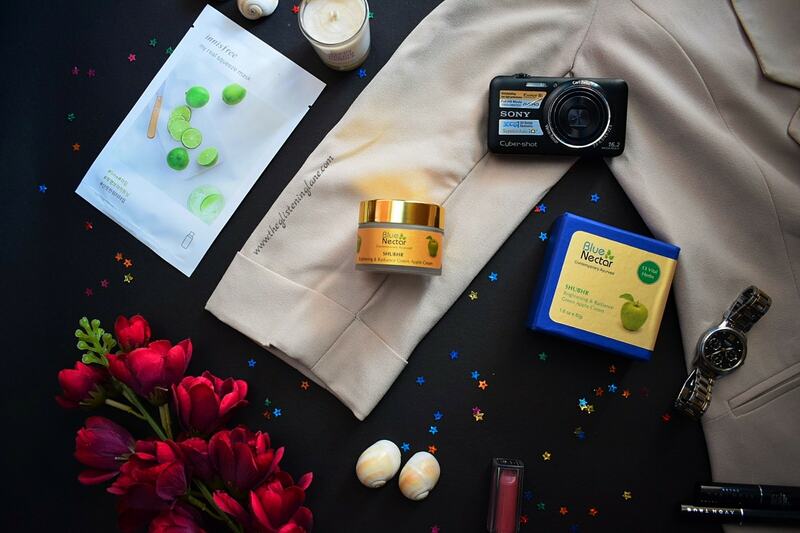 With its balanced formulation, cream is well suited for soft & smoother skin of women. Key Ingredients: Aloe barbadensis Mill (Aloevera), Glycyrhizza glabra (Mulhethi), Yashad Bhasma, Rubia Cordifolio Linn (Manjistha), Curcuma Longa Linn (Haldi), Glycerin, Santalum album Linn (Sandalowood Oil), Withania Somnifera Dunal (Ashwagandha), Pandanus odoratissimus (Kewra Flower), Prunus armeniaca Linn (Khumani Oil), Sesamum Indicum Linn (Til Oil), Cocos Nucifera Linn (Coconut Oil), Glycerin. Directions: On clean face, massage peanut drop size cream with firm hands using upward massage stroke on Face & Neck. To be used daily. Caution: Natural products can also be allergic to some people. Test patch on inner elbow and leave for 30 minutes. Discontinue if irritation occurs. 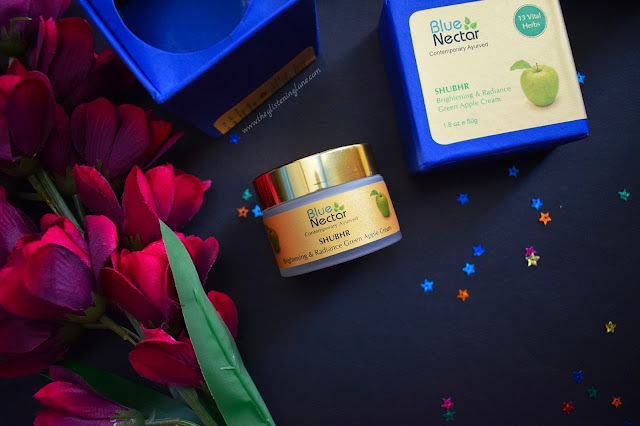 Buy Online: Blue Nectar products are available at their official website; you can order it from HERE. You can also hunt them up at other e-portals like Amazon, Flipkart and Nykaa. Blue Nectar products are not new for me, I’ve tried them before and their packaging simply speaks class to me. 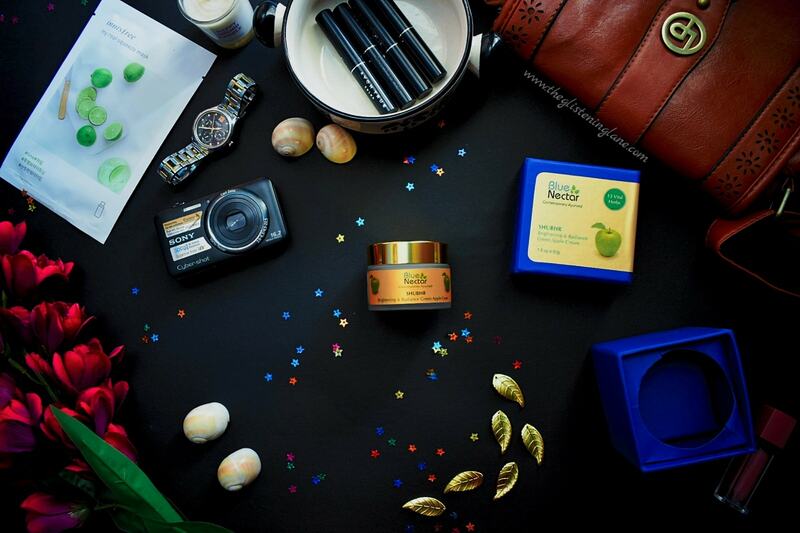 The Shubhr Brightening & Radiance Green Apple Cream comes in a blue cardboard carton with golden label stuck onto it. Inside, you will find a beautiful translucent glass jar of cream with a golden lid. For taking out the product, you need to unscrew the lid and remove a separator plastic piece. You can travel with it but I don’t think it can bear a fall; although *touchwood*, that didn’t happen as of yet! I personally loved the packaging and it gives a luxury touch to the vanity. 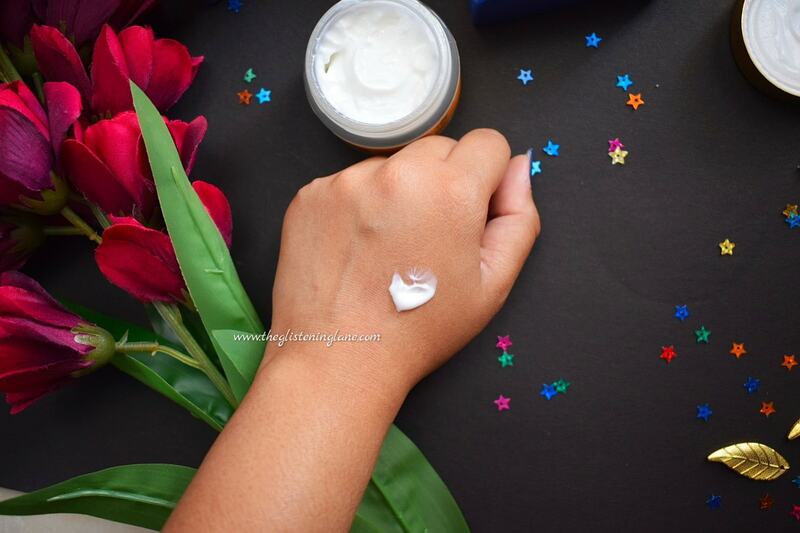 The formulation of this cream is very lightweight and post application, I feel no greasiness at all. For application, you won’t need a lot of quantity and little would do wonders. I take a small amount of the cream and dot onto my cheeks, chin, nose and forehead. It spreads well and not much hassle is required for the absorption of the same. On a cleansed skin, I apply my toner from The Faces Shop and then a layer of serum by the brand Vya Naturals. Since it’s a transitional weather and my skin has left behind its teenage years, I’m giving ample time to hydration. 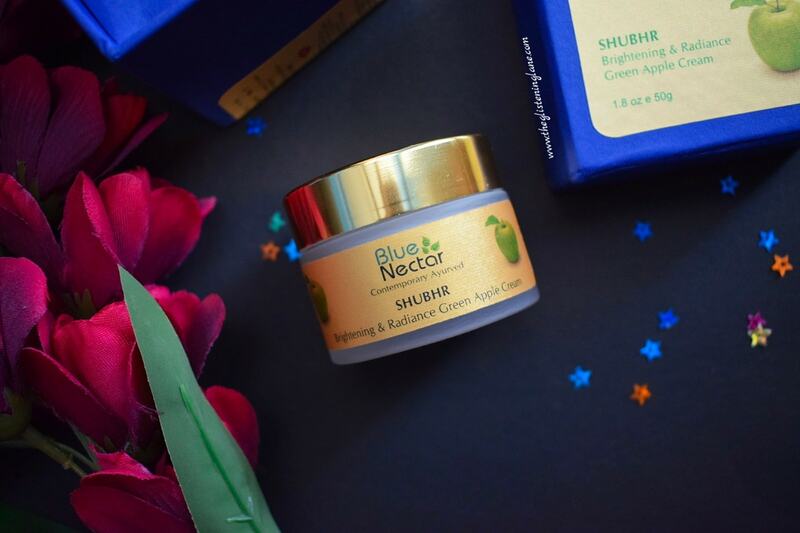 Before the dampness of serum vanishes, I apply the Blue Nectar Shubr Brightening & Radiance Green Apple Cream. For some reason, creams never worked well on my skin. They’d end up clogging my pores or making my face completely sweaty in the humid seasons. When I got Blue Nectar Shubhr Brightening & Radiance Green Apple Cream, I was under the spell of a dilemma. 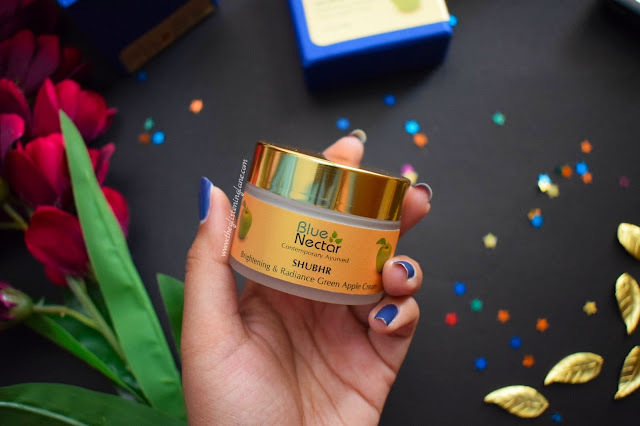 I had two Blue Nectar products approximately 1.5 years ago and they worked miraculously well for me. And then if this wouldn’t have fared well, I might have had developed some trust issues while picking more products from the same brand. That happened with me so often! On application, I was happy that the cleansed skin required pretty much a pea sized quantity. Apart from this, absorption wasn’t an issue herein. 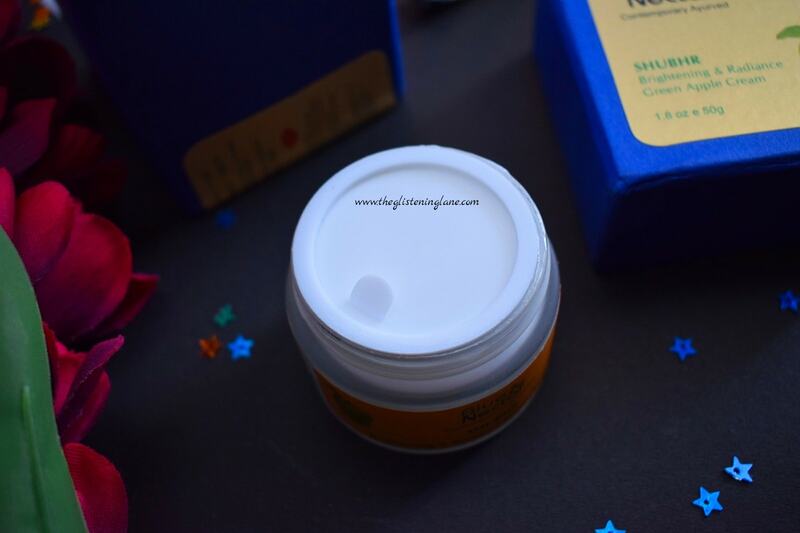 It melted away pretty easily and my skin felt supple and healthy in an instant. My skin felt so soft, smooth, clearer and brightened afterwards. I could notice that it made skin glow as well but until and unless someone legit complemented me, I didn’t consider the glow that evident. That’s all what I’ve got for you today! Do let me know if you’ve tried this brand before.